Reliance Jio’s free ‘Happy New Year’ is expiring on 31st of March. So, there will no longer be free voice calls, SMS & 4G data. However, that’s not the end to the awesomeness of Jio. 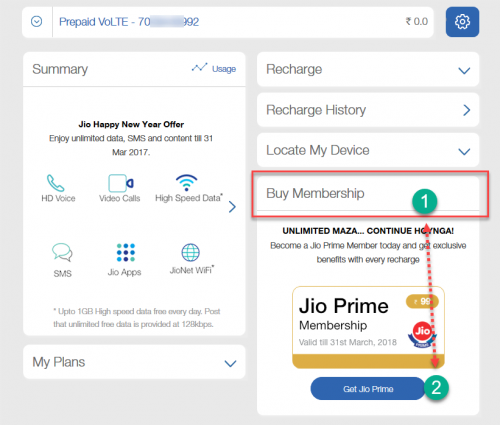 While Jio services will be chargeable from the 1st of April, Jio is introducing the ‘Jio Prime Membership’. Prime membership will allow the subscriber to continue to avail very attractive data and voice plans for 1 more year i.e. till 31st March 2018. 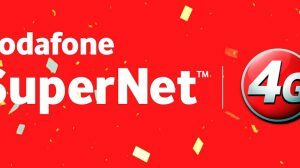 How to Join/Enroll for Jio Prime Membership? Yes, that’s right. Calling and texting to any network is going to stay free. No limits, no FUP, nothing. You can literally keep the call connected 24 x 7 and it will still be free. 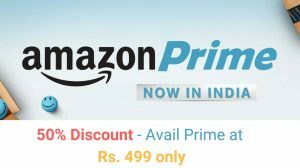 You can subscribe to Prime membership starting from 1st of March 2017 till 31st of March. No new applications will be accepted after 31st March. Prime Membership is only available to those subscribers who are already using Jio SIM card. 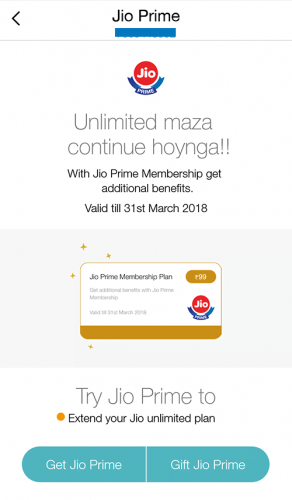 So, you should be a Reliance Jio user before 31st March 2017 in order to join the Jio Prime membership. Jio Prime is priced nominally at Rs. 99 for 1 year. After being a member, you need to recharge with Rs. 303 to avail the same benefits of ‘Happy New Year’ offer. If you do not want to spend Rs. 303, there are cheaper plans to choose from. And if you need more data per month, then you can pay more and subscribe to a higher plan. As a prime subscriber, you get to enjoy the following special voice and data plans. The plans start from as low as Rs. 19 per day and reach as high as Rs. 9999 for 1 full year. Also note that these plans will not be available to Jio users who do not subscribe to Prime. The above plans are very attractive and suits purposes of all types of users. The best thing about these plans is that SMS, calling and roaming is just free for all. 4G data is the major differentiator in these plans. Enrollment for Jio Prime is available starting from March 1st and ending on March 31st, 2017. Only present Jio subscribers can avail the offer. So, if you do not have a Jio SIM already, be sure to grab one in the coming days as the offer will not be available after 31st of March. If you want to activate the benefits on your main number, then you should port-in your number to Jio network before 31st March. Enrollment will start from 1st March.per day. Join/port into Jio network before 31st of March. Open MyJio app on Android or iOS device. You will be needed to update to the latest version first. Tap on the 3 bars ‘ ‘ at the top left to open the menu. Choose Jio Prime. Now tap on Get Jio Prime. You can also gift Jio prime to a friend by tapping on Gift Jio Prime. Make the payment of Rs. 99 via Cred/Debit Card, NetBanking or Jio Money wallet. Recharge with Rs. 303 in the month you wish to enjoy the free calls and data offer. If you do not have an Android or iPhone to install the MyJio app, then you can signup for Jio Prime membership from the Reliance Jio website. Here’s how to do that. Open Reliance Jio website (Jio.com) and click on the Sign in button in the top navigation. You can also click here to reach the sign in page. Enter your username and password to log in. In case you have never signed up, then you need to click on Sign up button and create your account. Click on the Buy Membership option in the My Account screen. Make the payment of Rs. 99 using Credit/Debit card or Netbanking. You can also use Jio Money to pay for your prime membership. Jio apps are not available for Windows Phone. But if you’re using the Jio SIM for data in Windows Phone then you can also subscribe to Jio Prime pack. You can simply open the Reliance Jio website as described above to recharge your number. Else you can visit a Jio retail store. Sailfish OS users can download the MyJio app from the Play Store and follow the instructions from the Android section. If the MyJio app does not work on your Intex Aqua Fish, then you can also recharge online by accessing your account from Reliance Jio website at Jio.com.